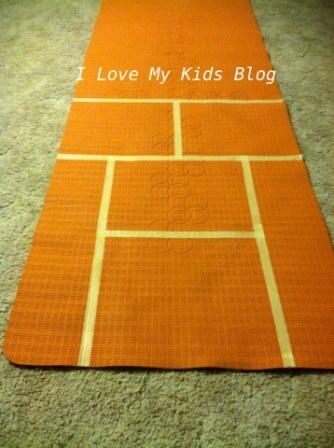 How to Make a DIY Indoor Hopscotch Mat with a Yoga mat! 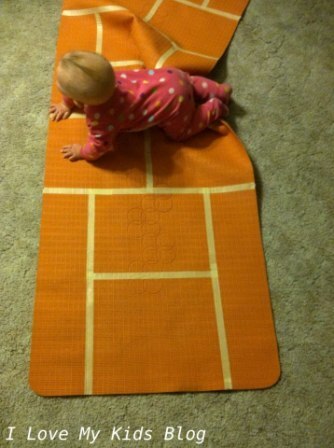 How to Make a DIY Indoor Hopscotch Mat in minutes out of a Yoga Mat! 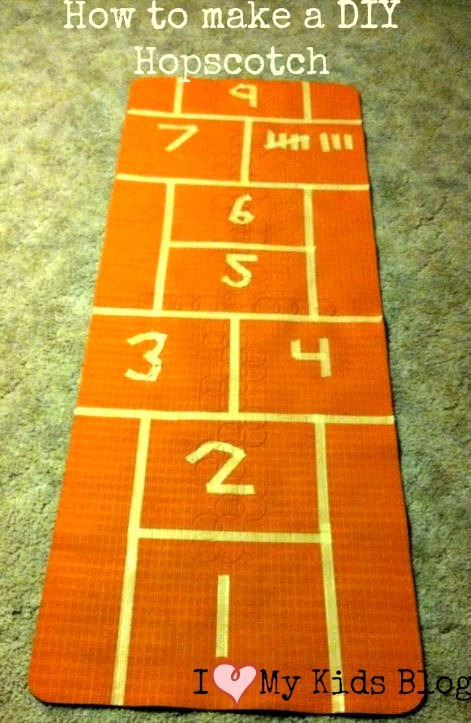 We have a four day weekend coming up and with high temps of -6 I figured I’d better get some fun indoor activities planned like this inexpensive indoor hopscotch mat! In the summer time, my kids will use sidewalk chalk and draw several different kinds of hopscotch games. Since the ground is covered in snow and their little bodies would freeze if they tried to play outside I thought I’d bring one of their favorite summertime games inside this weekend. By creating an inexpensive but fun indoor hopscotch mat, with items I already have in my house, making this a totally FREE fun project to do with my kids! 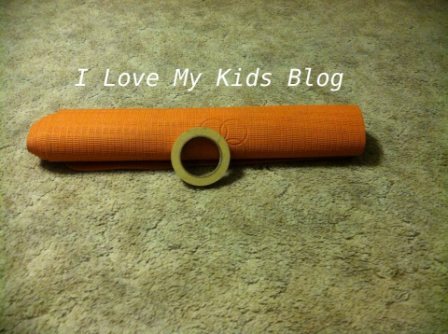 To get started, all you need is a yoga mat and masking tape! 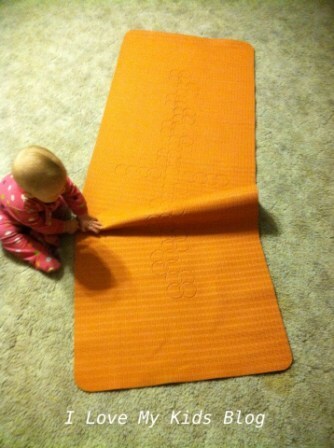 You may also get helpers-but this is optional-7 month old’s are SUPER HELPFUL (insert sarcasm here!) when making this project! 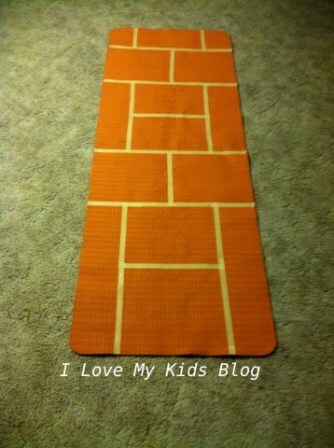 😉 I love that the yoga mat is already slip resistant so it can be used on any type of flooring safely. So when (if-is more realistic for me honestly) you do yoga it won’t affect you at all. 🙂 Begin taping off hopscotch sections. You can choose any pattern you want! Once all your sections are taped off the fun really begins. You can design this however you want to! 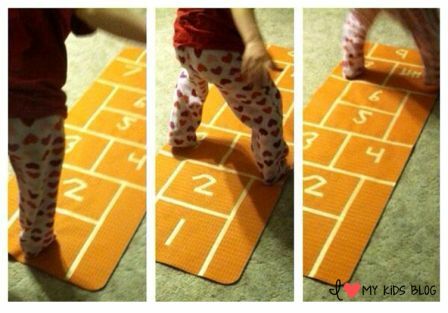 If your child is working on Roman numerals in school, or tally’s, or letters, or having trouble spelling a specific word…you can make a indoor hopscotch mat to help them learn it better! The masking tape is very easy to remove and fairly cheap so you can change it up as often as you want! See how I threw 8 tally’s in there for the # 8? Then it is play time! You can make bean bags or scotch tape balls to toss instead of a rock. This fun indoor hopscotch mat was easy to make (even with my super helper’s “help”) and my 8 year old had a fun time playing on it this evening. I can’t wait to pull it out over the long weekend with my two other children! I had the items on hand, so it didn’t cost me anything. I’m hoping it will help my kiddos let out some energy this weekend!